Designed by Aberrant Architecture, The V&A Family Tree celebrates the Museum’s collection and has sustainability at its heart. 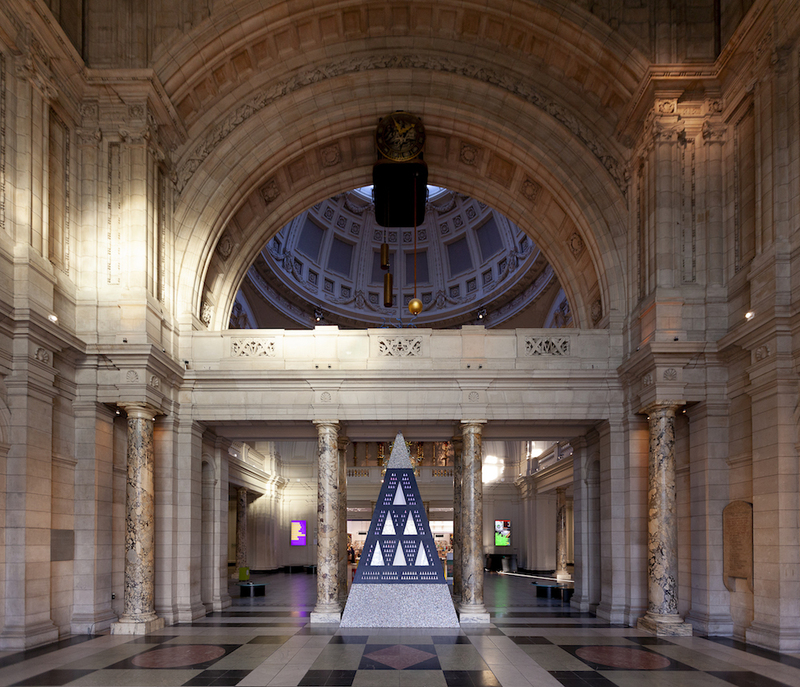 With an artificial Christmas tree creating a carbon footprint over 20 times larger than a farmed tree, The V&A Family Tree needed to balance sustainable materiality while standing as a reminder to avoid waste in a period of often excessive consumption. Standing at over three metres tall, it is made with materials using upcycled waste like the colourful speckled top and bottom made of recycled plastic bottles, and the sleek blue middle section made from a recycled paper composite. The design of the tree was inspired by the cover of a book called The Christmas tree, illustrated by Fredun Shapur, which can be found in the V&A’s collection. Within the tree's twelve backlit windows sit toys taken from the archive of the V&A Museum of Childhood and reproduced in recycled laser cut cardboard.